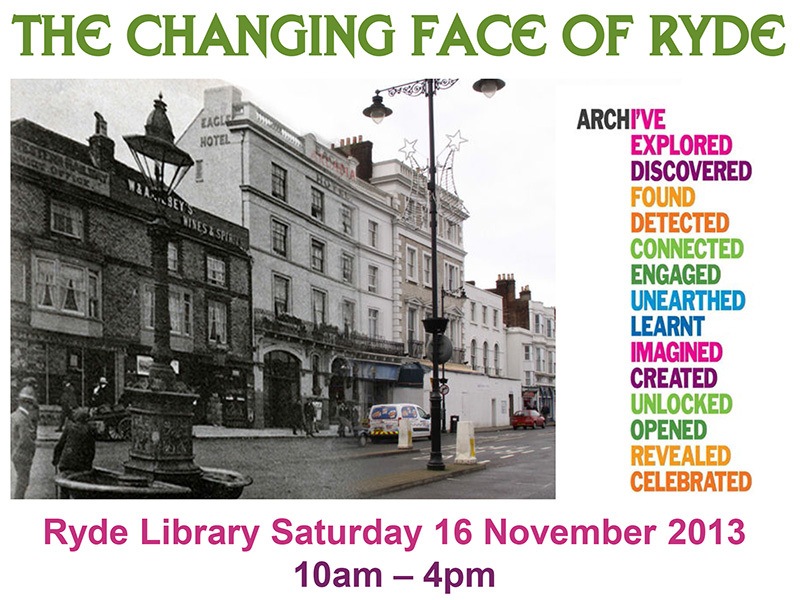 Ryde Social Heritage Group will be officially launching their new project ‘The Changing Face of Ryde’ at an all day free family event on Saturday 16 November at Ryde Library. The project will be looking at life in Ryde 100 years ago, and discovering what it was like for families living here and how, like people across the world, the First World War was going to change their lives (and change the world) forever. The First World War would be very different from the Victorian/Imperial campaigns many had glorified in. Every family, rich or poor, would be affected in some way. Ryde had grown and prospered during the Victorian era, maintained its status during Edwardian times but what happened next? To answer this and many other questions RSHG will be encouraging families and the community to learn how to start their own research into how Ryde changed with the onset of war and beyond. Using our own extensive research files, local archives and resources, maps and family stories, we aim to help build the story of Ryde to connect current and future generations with the lives, stories and impact of the First World War. RSHG has joined the Imperial War Museum First World War Centenary Partnership, a network of local, regional, national and international community, cultural and educational organisations who will be organising events and activities in their areas throughout the centenary. We will be holding workshops, exhibitions and ‘how to’ sessions to help people research, document and share their discoveries. We will show you how to start a ‘story box’, scrapbook or family history shrine to store family memories and stories. Was your family living in Ryde 100 years ago? Did any of them go to war, become a casualty or were they lucky to survive? What about those left at home, the women and children, the elderly or infirm? Do you know who lived in your house 100 years ago? (or who/what was on the site of your house if it is not that old!) How different was their family to yours today? Do you know what your street was like a century ago? What sort of people lived there? What were their occupations? How has it changed today? What social events took place in Ryde a century ago? What hobbies and pastimes were popular? What changed with the onset of the First World War? The world was on the brink of war, but most families were just getting on with their normal lives. We invite everyone to come and take part. RSHG Members will be available in Ryde Library all day (from 10am) on Saturday 16 November to help you start your research, show you some of the resources available and share stories and their discoveries about the town. There will be displays, research folders and ideas to do at home. Start your story box or scrapbook. We will have some examples on display and can help you make your own. If you already have a ‘keepsake box’ full of those special moments to remember and pass on bring it along to ‘show and tell’ your story. You’ll be amazed at what you might uncover. The project will continue throughout the First World War Centenary with themed exhibitions, open days and workshops. The first exhibition in Ryde Library will continue from 16 November until 20 December 2013. The first planned open days at Ryde Cemetery will take place on the weekend of 24/25 May 2014 when the theme will be ‘Ryde on the Brink of War’. Visit our website www.rshg.org.uk for more information.